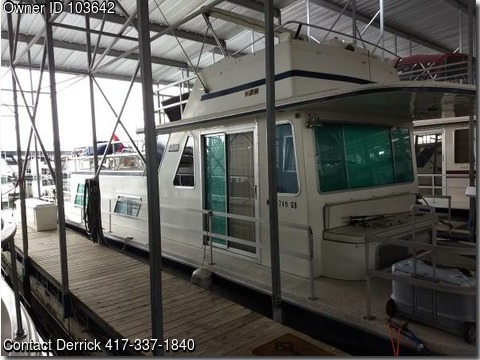 Boat is located in Branson,MO.Please contact the owner @ 417-337-1840...Remodeled 42' ×12' houseboat with twin Crusader model CH270 V-Drive engines, and 6.5MCCK Onan Marine Genset. 100 gallon fuel capacity, 40 gallon waste, and 50 gallon water capacities. With functioning flybridge with plenty of seating. Has Marine air to condition the inside where there are two single beds and a queen bed along with a full size couch, electric heater, full bathroom, electric heater, full refrigerator, and good size kitchen. There are also plenty of places for storage with three indoor closets. Wood flooring thruout the main area and carpet downstairs. Uses two 30 amp/125 volt shore power and cable connection. Slip will go with the houseboat. Extra Crusader CH270 also included.